15 Jun What a Difference a Week Makes! I write the Natureworks weekly email on Tuesdays. One week ago today it was 40 degrees and raining- so cold that we all were wearing 3 layers and the heat was on. Today it is 90 degrees outside. That’s Connecticut- if you don’t like the weather, wait a minute. It takes a bit of getting used to but it sure feels good. You wished for the warm, sunny days, now they are here. What does this mean for the garden? 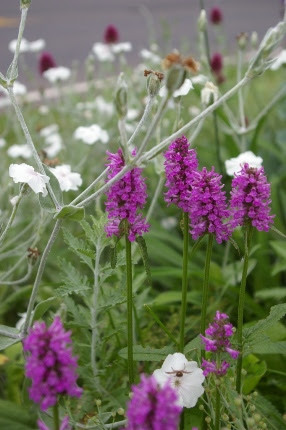 White Lychnis chalcedonica and Stachys ‘Hummelo’ in the Natureworks garden by the road. An easy combination for mid-June. and don’t forget, they make great cut flowers. Diane captured a gorgeous shot of yellow yarrow at the top of this email, with blue Campanulas behind it. Many peonies are still blooming and roses- wow! When you walk out my office door at home you are greeted with rich, red David Austin roses and purple lupines. It is stunning. With the onset of sunny days, you may want to give your plants a little boost. 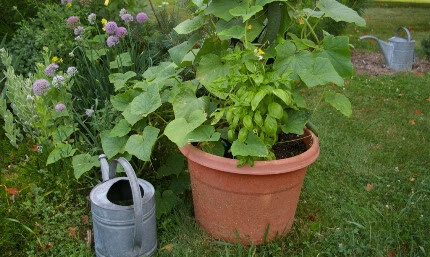 I have watered my containers and veggies with Organic Plant Magic to help build stronger root systems. When it rains for a long time, the nitrogen in the soil is leached away. It is important, especially in containers, to feed often. A pinch of Healthy Grow granular fertilizer in each pot also helps to replenish the nitrogen. We have been so spoiled when it comes to watering. We need to start paying attention now. I do the rounds every morning before I come to work and check again when I come home. BUT, don’t be tempted to “sprinkle” your plants in late afternoon if they are wilting and the soil is wet. See my article below to explain why this is a mistake and learn how to water correctly for the long term health of your plants. Lilacs done blooming? Rhodies over the windowsill? Learn how to prune spring blooming shrubs at our two free workshops this week. The June Prune is here! This Thursday evening, and again on Saturday morning, I am giving one of my most popular walks of the year: The June Prune. This is a basic primer on how to prune woody shrubs. Right now we are working on shrubs that have just finished blooming. They bloom on last year’s wood and will set up their buds for next year within the next few weeks. The window to do this work is short. We will put the first 15 minutes of this talk up on Facebook Live. Then we will go out into the garden with the class. If you watch it Thursday night and need more help, come to the walk Saturday at 10.
wisteria arbor. I still saw many live caterpillars on an apple tree in Durham. We are all hoping to stop this infestation in its track with this naturally occurring fungus. The rain has also brought out the slugs. The marigolds in my veggie garden were eaten. As soon as I noticed, I put down Sluggo and also sprinkled them with diatomaceous earth for good measure. Then I fed them and they will probably grow right back. I also added calendula plants and nasturtiums to the edges of the beds to make it more colorful and to have a nice supply of edible flowers for salads. We have ladybugs and praying mantis egg cases in stock. We are constantly working towards a balance here at Natureworks and in our home gardens. Warm weather after lots of rain brings on the aphids- so bring on the ladybugs to eat them and forget about spraying. Got elderberries? We do. Enhance your home habitat and plant an edible fruit beloved by birds, healthy for humans, with flowers that pollinators adore. I took this photo at the cafe at Wisely in England last summer. in England last year, they had all sorts of beverages featuring these beautiful, lacy blooms. They attract beneficial wasps and all kinds of pollinators. 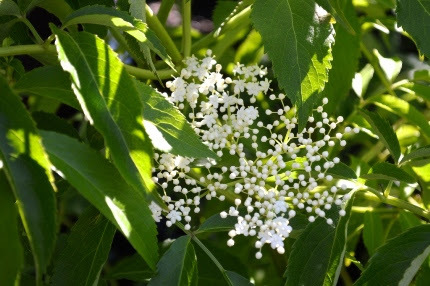 And then they turn into berries, a true superfruit, from which we make syrup and elderberry liqueur. 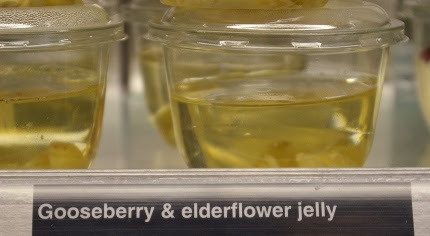 Do you have an elderberry yet? 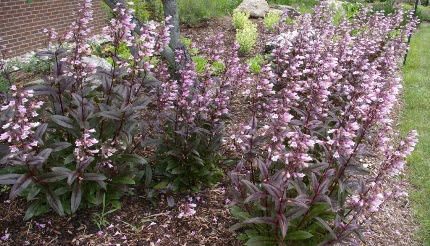 It is one of the best plants to enhance your backyard habitat. Yes, I share the berries with the birds but there always seem to be enough to go around. on our benches. Finally, it decided to lay eggs on the tropical Asclepias curassavica on our annual benches. Before our eyes we watched her lay over THIRTY eggs! We immediately brought the eggs inside and placed them in our hatching boxes. At home on Sunday, I was pleased to watch an Eastern black swallowtail butterfly go from fennel plant to fennel plant and lay eggs. 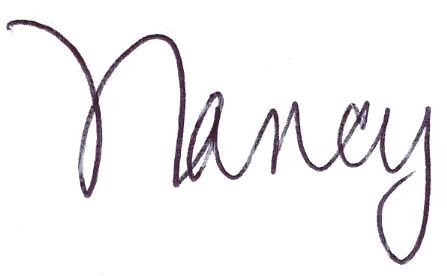 This was a much slower process, she took her time with each one, unlike Mrs. Monarch who was very quick about it. 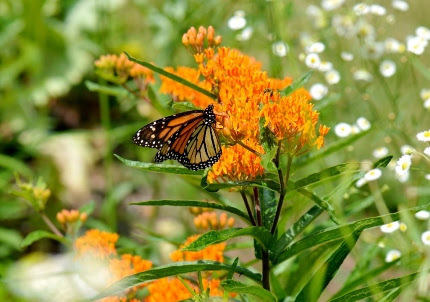 We have a wonderful page devoted to monarch butterflies on our website. Last year we raised and released over 700 monarchs from eggs and caterpillars we collected in the Natureworks gardens. You can too. Click here to read all about it and check out the calendar of events for NEXT week when we will be having two free workshops. 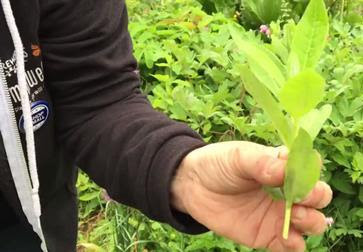 If you already have a good stand of common milkweed in your yard, you should prune some of it in half this week. This makes it branch and creates shorter, bushier, fresh growth for the monarchs that will be arriving later in the summer. Diane did a little video demonstrating this. Click Here to view it. We still have many healthy, robust organic veggie seedlings on our benches. The moon was full last Friday and I spent a lot of time on Sunday planting root crops- carrots, potatoes, onions, and gladiolus bulbs. The moon calendar indicates that Thursday and Friday will also be good root planting days. Why not put in another row or two of carrots and beets? We’ve got the seed and I bet you can find the room. Keep on planting! Cut off your garlic scapes and cook them into delicious dishes! The garlic is starting to flower. 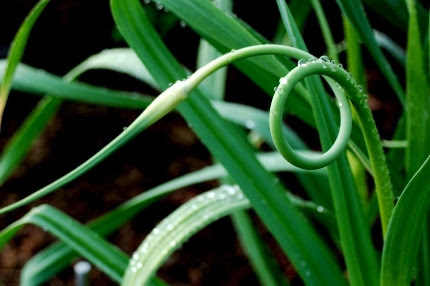 As the buds rise up from the plants, they form little curly cues that you have to cut off- they are called garlic scapes. Don’t let them flower as they will take a lot of energy from the developing bulbs. What you should do is cook with them. Monday night I made garlic scape pizza- I harvested them fresh and chopped them up. Yum! You can grill them and make pesto from them. They are a delicacy and you may see them sold for a lot of money in specialty grocery stores. Scapes come from the hard neck garlic that we sell in the fall. I will harvest my garlic by the middle of July and then that entire bed will be empty and ready for more crops. I usually plant pole beans and more summer squash at that time. Did I mention that you should just KEEP ON PLANTING!?! If customers keep coming in asking the same question of my staff over and over, I realize it’s a trend happening in our gardens. This week people have been lamenting about the leaves on their Joe Pye weed and butterfly bushes. If your leaves look like this, suspect earwig damage. They come out at night and hide under garden debris at ground level during the day. It’s incredible how high they can climb and how much damage they can do. In my own gardens, I don’t bother with them because when both of these plants flower in July, I don’t really care what the leaves look like as the flowers are so beautiful. But for client’s gardens, and for customers who do care, you can sprinkle Sluggo Plus at the base. This contains Spinosad which will kill the earwigs. Another option is to put an empty paper towel cardboard tube on the ground under the affected plants in the evening. In the morning, pour the earwigs that are hiding inside into a bucket of soapy water with a couple of drops of canola oil in it. 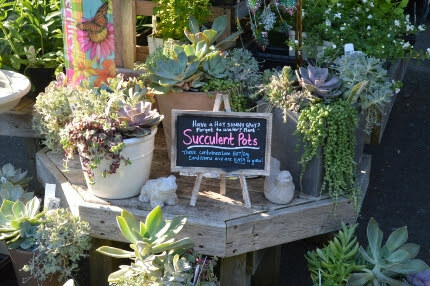 Finally, if watering isn’t your thing and you want to beautify your porch and patio without a lot of fuss, consider adding succulent pots to your outdoor decor. We’ve got them, in all shapes and sizes. And they are just SO pretty and textural and fascinating to look at. Come in this week and learn how to prune. 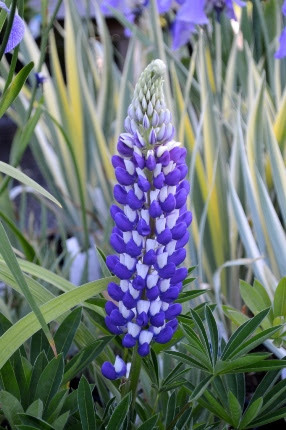 Grab some colorful new perennials to fill in the gaps in your gardens. My theory is MORE PLANTS=less weeds and less mulch. Fill in the gaps with perennial beauty and you will benefit for years and years. 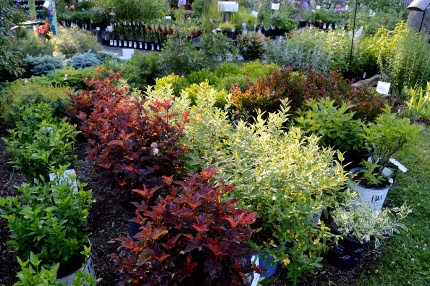 The trucks continue to roll in and our benches are overflowing with new varieties of perennials to help you add summer color to your gardens. Phlox X ‘Fashionably Early Crystal’ and ‘Amethyst Pearl’ (shown above) are complex crosses of various Phlox species that offer billowing mounds of soft color NOW, in June, after the spring blooming phloxes are finished and before the tall summer phloxes begin their show. They are clean as a whistle, fragrant, and great for cutting. in bud, fading to a soft creamy pink when full open. It does not set seed, therefore it is very long blooming and will not self-sow. 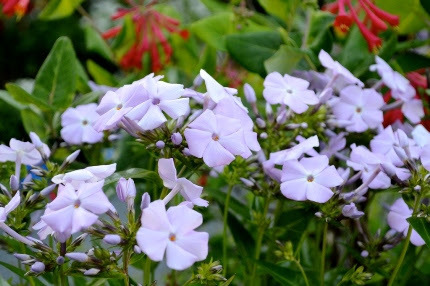 Growing 18-24″ tall, it would be great in containers as well as in the border in full sun. Campanulas all make great cut flowers. hardy perennial that not only has colorful foliage, it also attracts tons of pollinators to the garden. The leaves are a bit darker than its brother ‘Dark Towers’, a plant I use continuously in my garden plans. Both attract attention even when not in bloom because of their beautiful burgundy leaves and flower stems. 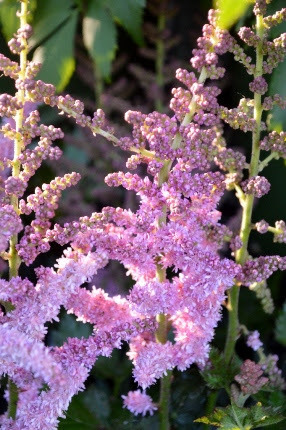 The flowers are tubular, soft pink, and offer nectar to hummingbirds as well as native bees. 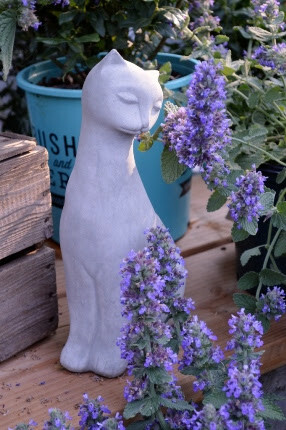 Agastache is one of the mainstays of our summer gardens. Right now we have SEVEN varieties and they are gorgeous. The one that really attracted my eye over the weekend is ‘Purple Haze’ with thick spikes of purple flowers all summer long, especially in the August heat when other perennials fade out. Agastache ‘Purple Haze’ has big fat flower spikes. ‘Blue Boa’ is another improved perennial variety, and one that earned a prized spot in front of our Monarch Waystation sign in our gardens. We also carry many colorful tender perennial varieties including the very popular ‘Salmon Pink Bicolor’ and the yummy orange ‘Tango’. These are often used as centerpieces in containers and will continue to bloom until hard frost. 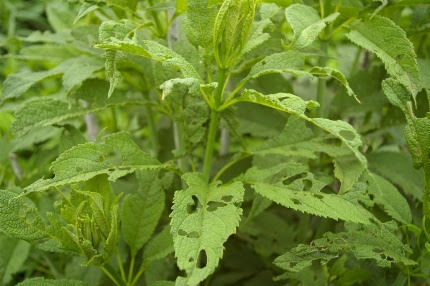 The flowers and the foliage are edible and taste like licorice mint. 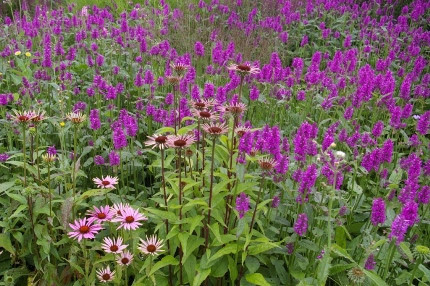 Stachys ‘Hummelo’ and Echinacea woven together in an Oudolf designed garden in England last year. green, wavy foliage that is very low maintenance. 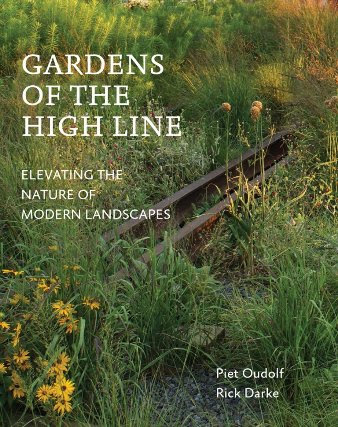 We just got in a fabulous new book Gardens of the High Line by Rick Darke and Piet Oudolf. I immediately snapped up a copy and have been pouring over it at home. Rick Darke is a wonderful photographer and the various sections of the High Line are described in great detail. It will be an inspiration to you- stop in the shop and get your copy when you come for a visit this week. Do Your Plants Wilt in the Afternoon? With the arrival of hot weather, I hear a lot of people complaining about how much work it is to water their garden every day. STOP! Once your garden is planted and the plants have settled into place, you shouldn’t have to water daily. That is the wrong way to do it! Almost all plants wilt in the heat of the afternoon sun when the temperature climbs into the 90’s. The first thing to do is feel the soil beneath the mulch. If it is wet, don’t water. Instead, go back outside and check on the wilted plants at dusk. If they have perked up, they were just drooping from the sun. When they do need to be watered (usually once a week in normal soil) they need a DEEP SOAKING. I place the hose at the base of each plant and let it run until the well around it is filled and soaks down. Sprinkling a little bit all the time is THE WORST THING YOU CAN DO FOR YOUR PLANTS. It may feel righteous to be out there with the hose, but all you are doing is wetting the surface of the soil. This encourages the roots to rise up to the surface where…wait for it… they are exposed to the heat of the sun and they DRY OUT. It is an endless cycle if you encourage shallow root systems. Instead, send the water deep into the soil and make the roots grow downward and find it. This creates a sustainable landscape that doesn’t require all this babying and coddling from you. Yes, keep your eye on newly planted trees, shrubs, and perennials for the first few weeks. And DO add a two inch layer of organic mulch around the plants to keep the moisture in the soil. But don’t get caught up in this shallow sprinkling routine. It actually hurts the plants and makes you feel overwhelmed by a garden that should be giving you pleasure. Superior Shrubs that We LOVE! Abelia- Glossy Abelia has been a plant that I have loved for decades. The leaves are shiny and very clean, not prone to diseases or insects. The original species, A. grandiflora, has green leaves and pink tubular blossoms. It can grow 4-5′ tall or more, depending on how far back you prune it each spring. It blooms on current years wood. Right now we have three fabulous dwarf cultivars in stock. 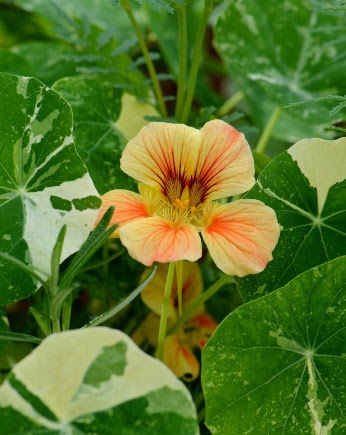 ‘Mardi Gras’ has a yellow and green variegated leaf. 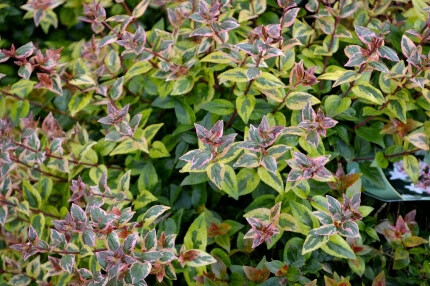 ‘Radiance’ has a cream and green variegated leaf. ‘Rose Creek’ has green leaves. 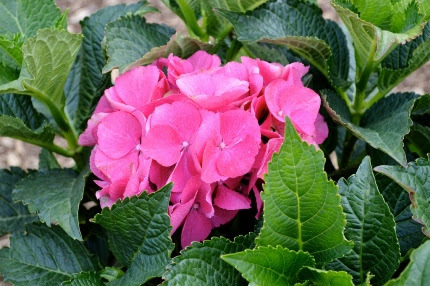 All are compact plants, growing 2-3′ tall and 3-4′ wide and all have the same pink, tubular blossoms from JULY until the end of October! That is a very long season of bloom for a shrub. They attract butterflies and hummingbirds galore and will tolerate full sun or dappled shade. 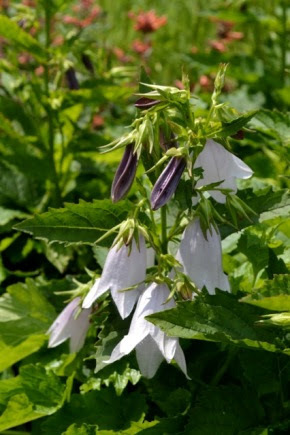 My favorite use for these plants are in renovated foundation plantings, adding color later in the season after the early spring blooming shrubs (like azaleas and dwarf rhododendrons) are done flowering. blossoms that turn to a vivid purple/magenta later in the summer. This is a reliable bloomer and reblooms well. ‘Cityline Paris’ is ideal to incorporate into perennial borders (near the front) or in renovated foundation plantings. Did I mention this makes a great fresh cut and dried flower? Get Ready Because Here They Come! Can’t make it to the shop? Join us on Facebook at 5:30 pm. Nancy and her staff will share with you what is currently happening at the garden center and answer your questions. 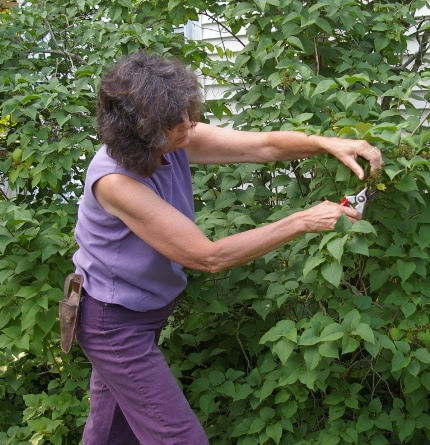 The subject for this evening will help you prepare your garden for migrating monarch butterflies. What can YOU do to help the monarch butterfly? Plenty!! Learn about their life cycle, their food sources and more. Based on what we see in the gardens, there is even a chance you’ll get to take a close look at monarch eggs, caterpillars and chrysalises. This year, join us in raising the next generation. 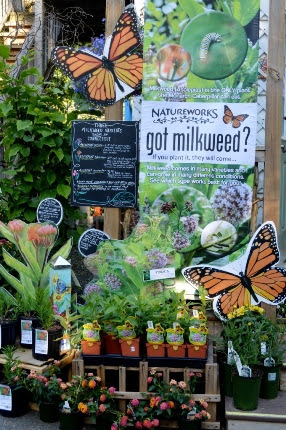 We have everything you need to raise monarchs this year! FREE event.